Here is a funky stinkhorn that is apparently limited to Central America, the Caribbean, and northern South America. Like other stinkhorns it produces a spore-laden, foul smelling slime that attracts insects--but unlike any other species, it produces the slime on a specialized surface suspended between vaulted, crested, fringed arms. If you have seen The Lord of the Rings, this species is reminiscent of Sauron's Great Eye, suspended atop the evil tower, Barad-Dûr . 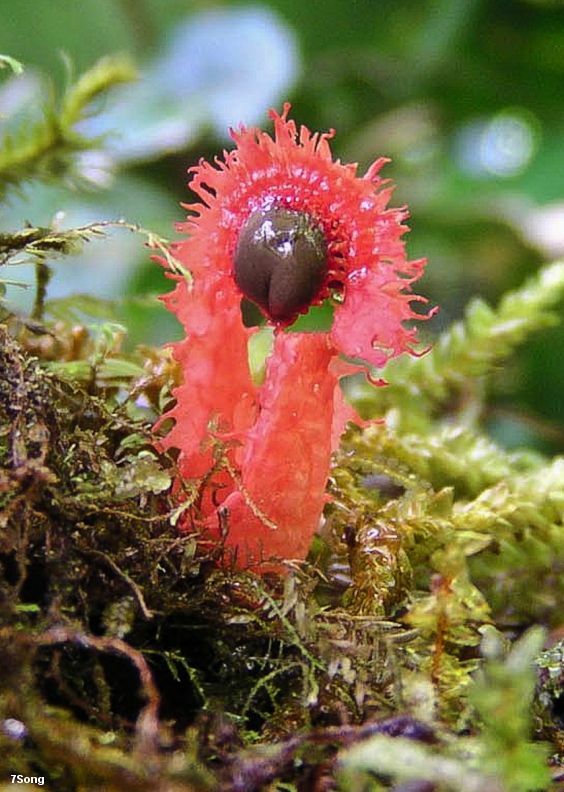 . . except that Laternea pusilla is pink and tiny, maxing out at about 6 cm high, and the little tower sits peacefully in lush, green cloud forests instead of the desolation of Mordor. Ecology: Saprobic; growing alone or gregariously from moss-covered rotting wood or from forest debris near rotting wood; montane (4000-9000 feet); Central America, the Caribbean, and Guyana; June through November. 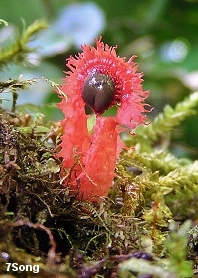 Fruiting Body: When young appearing like a tiny whitish "egg," but soon "hatching" and developing into a structure measuring up to 6 cm high, composed of 2-3 (occasionally 4) unbranched, pinkish red to pink arms that are joined at the top in a corona-like arch; arms about 5 mm wide, in cross-section semicircular to circular; the edges prominently scalloped or, with maturity, tattered and fringed; spore slime dark brown, produced on a central, suspended structure under the apex of the arms; bases of arms free, but encased in a whitish volva; base attached to white rhizoids. Microscopic Features: Spores 3-4 x 1-2 µ; cylindric; smooth. REFERENCES: Berkeley & Curtis, 1868. (Saccardo, 1888; Sáenz & Nassar, 1982; Dring, 1980; Calonge, Mata & Carranza, 2005.) I have not collected this mushroom.